Have you ever been completely rewired? If not, join us for the next TTI ‘Rewire’ Intensive Seminar. This TTI six-week Intensive course will encourage you as a student to become a multidimensional thinker, learning to perceive, process and express a variety of points of view on contemporary, personal and social issues from a biblical perspective. So what does that look like? You will receive teaching on the Old Testament Template that looks at the spheres/domains of society and their biblical role and function. You will learn a critical thinking model that will give you foundations on how to think and process through issues the world is facing today. Lastly, you will learn a leadership tool for communication that teaches you to understand the intrapersonal dynamics that influence your thinking. The TTI 6 Week Intensive was originally taken from the Advanced Principles of Communication School that was started by Landa Cope in the College of Communications. 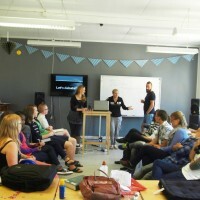 The first 6 weeks of the seminar is in a classroom setting at various YWAM locations. If you are a College of Communications degree student, or someone who is wanting to spend more time looking at world issues, you can continue with our 6 week online course to receive all 12 credits towards your degree. This six-week course requires the student to work at a mature level of self-motivation, initiative, and emotional stability. It is an INTENSIVE therefore plan to set these 6 weeks aside for study! Dr. Matt Rawlins is a passionate educator and a brilliant communicator. Matt has a Ph.D in Leadership Development and has lectured in many countries. Currently he is the CEO of Green Bench Consulting. He specializes in communication and leadership. During the seminar he will teach various tools to enhance your intrapersonal communication skills. These tools will increase your awareness of your own thinking patterns and how they affect your communication with other people. Landa Cope has a Bachelor’s degree in Art and Education and a Master’s degree in Humanities and International Studies. Landa has been a leading voice in the Body of Christ for over 40 years. She has taught God’s principles to pastors, heads of State, government and business leaders around the world. She is a master Bible teacher and will help better train you to look at world issues through a Biblical grid. Join us for Landa’s week and understand more of God’s heart and passion for the areas of government, business, science and family. This is what people are saying about TTI ‘Rewire’. This seminar is U of N accredited. DTS is not required for this seminar.